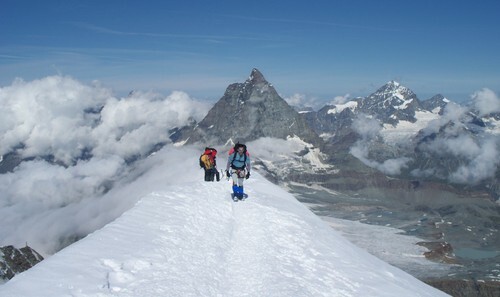 Home » Uncategorized » A Loooong day out on Italian Ridge, The Matterhorn. 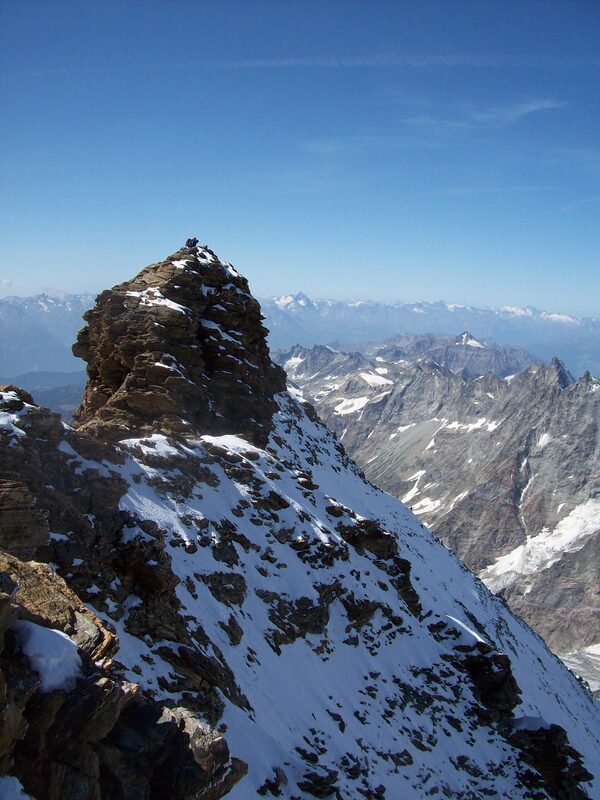 A Loooong day out on Italian Ridge, The Matterhorn. August 2009. Steve Kedward and I had booked 9 days in the Alps and had been steadily acclimatising on the Valais East peaks around The Breithorn area. The weather had been changeable at the start of the week and we had not been able to see The Matterhorn because of cloud on a few days. View back down the ridge, with our real goal behind on the skyline! 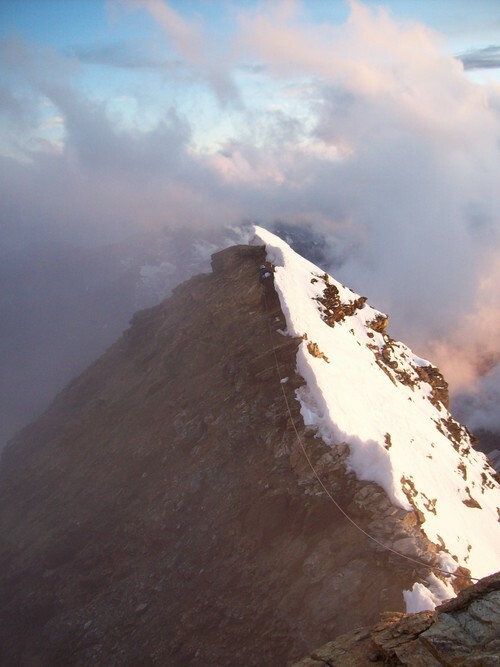 Our aim was to climb to The Carel Hut, stay overnight and summit via The Italian Ridge the next day. If the hut was quiet, we might stay a night on descent or just push on down to the valley. Finally, we got the forecast we wanted and we were off! 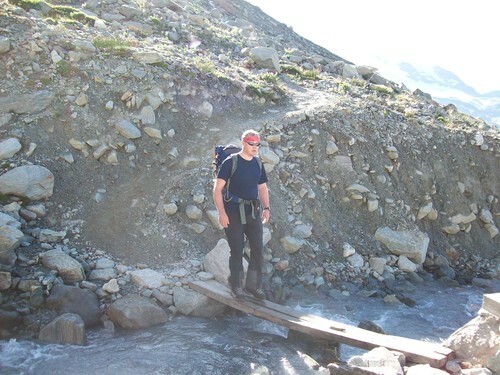 At 0800hrs we left the cable car at Plan Maison, to begin the trek around to the Carel Hut. Already the sun was coming through and there were other hikers going in several directions. We had checked with the guides office and been warned to carry a lot of water as reports were being received of very little to be found on the hill. As a result of this, our packs were heavier than we had planned. The approach route takes a rising traverse north and then west until it reaches The Duke d’Abruzzi Hut. The sun was pleasantly warm, bordering on hot as we crossed bare ski piste roads and then began the climb up through old moraines. A few times we crossed fast flowing clear streams and took the opportunity to drink plenty. The guides office said there’d be no water! From Abruzzi Hut the route starts to wend it’s way steeper over rocks and scree fields until it reaches a steep gully that needs to be scrambled. It skirts a snow field on the flanks of Testa del Leone, until you arrive underneath the headwall. It then follows a line across the shattered and sometimes loose scree until you drop into the col between this mountain and The Matterhorn. Until this point, we had been able to find plenty of water and were a little disappointed in the advice to carry so much of it. My advice would be to carry empty containers as far as the snow field and fill them up there from the millions of gallons that are running off the hill! We had a quick conversation with 3 English guys who had turned around at Pic Tyndal. Their ‘water’ advice was to collect snow below the Carel Hut as there wasn’t too much above it and the melt water was in scarce supply. Some easy scrambling over slabs and scree brought us to the first of the fixed ropes. Climbing this free, in rock boots with no rucksack would be quite pleasant. However, with big mountain boots and a pack, it was a little harder and the fixed ropes were put to good use! Steve K alongside the fixed ropes below the Carell hut. Picture taken in descent. 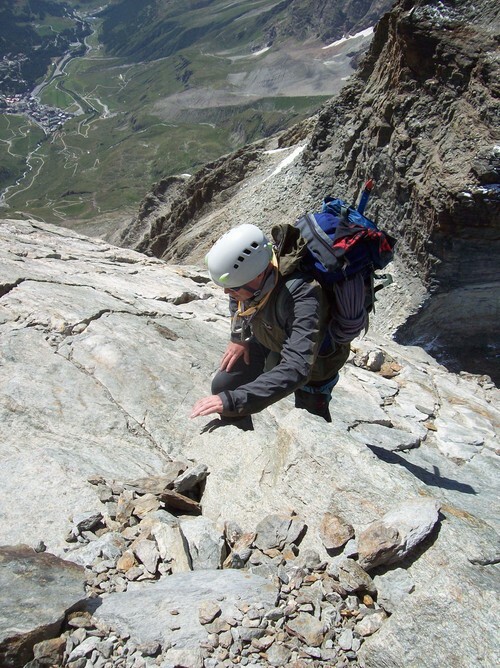 Nigel lewis on the slabs below Carel Hut, The Matterhorn. The slopes of Testa Del leone can be seen below, with the route following the top of the scree line below the headwall. The small snow field below the hut seemed to contain a fair bit of toilet paper and nasty looking brown smudges so we decided that the ‘collect snow from here’ advice was best not followed! We limbo danced our way off the slabs under the hut balcony and then into the hut. The guidebook time from Abruzzi was 4 to 5 hours, and we had managed to do it from Plan Maison in 6, so we were fairly happy with our rate of progress. There were quite a few climbers there, and a few coming off the mountain who had obviously been to the summit. The hut consists of a kitchen area with benches and tables, with a set of gas burners for cooking and melting snow. There is a guides only room that leads off the kitchen. The main sleeping area leads off the other side of the kitchen and at first appears to consist of two tier bunk beds that run down each side of the hut. Closer inspection shows that what seems to be an attic hatch is actually the way to a third level of bunk beds. There are pillows, mattresses and blankets; a smell of cabbagey farts and damp. Outside, there is a door that leads to the gas storage area and the evil long drop toilet, that is actually a ‘short’ drop toilet due to the pile of human waste that has built up. It actually falls on the snow field that is below the hut, so we were delighted with our decision not to take the snow from there. A poor sleep was occasionally interrupted by earlier climbers leaving their beds, and although most of them tried to be quiet, in the close confines of the hut, it was difficult not to disturb others. Our alarm went off at 0400hrs and it wasn’t difficult to get up as we were keen to go. The kitchen area was a nightmare with extra guests who hadn’t found a bed, lying under tables, between benches and generally in most available flat space. We ate a bit of breakfast and squeezed into our boots and coats. By 0450 we had tied into our rope and were off onto the slabs above the hut. Almost straight away, there is a line of fixed gear to follow. Route finding was easy, what with the ropes and chains, and the 10 or so other people that all left round about the same time! A rope leads up to a fixed chain that heads a steep wall and then hangs out and around a small roof. The chain was cold and icy, difficult to grip in gloves, but at least you knew you were going in the right direction. Some steps up and over slabs lead to a ledge called the Mauvais Pas. We moved together, clipping bolts as we went. We then reached a fixed wire that is best treated like a safety line on a Via Ferrata. We had thinned out from the other people but as we neared the end of the line, a bit of a jam was building up. 2 French speaking men behind us decided to leave the fixed line and scramble alongside it into the little col above. No problem, that’s their choice, but the rope between them now cut across everyone else waiting to move on. Ahead of us, two parties were vying to get ahead of each other and getting themselves into a right mess! We got into the bowl above the Linceul ice field. Here the route description reads ‘scramble up to a fixed chain’ but doesn’t really help with which direction to go in. We took a while trying to find the right line, sometimes getting ahead of the crowd, sometimes having to get back behind them. It was obvious that everyone wanted to get ahead and we probably all looked like ants when the nest gets kicked! We got to the fixed chains about the same time as 2 other French guys, and they seemed to be faster than us so we let them through. The other 2 pushy French guys were behind us and just behind them was a Spanish speaking pair who seemed to be father and son. 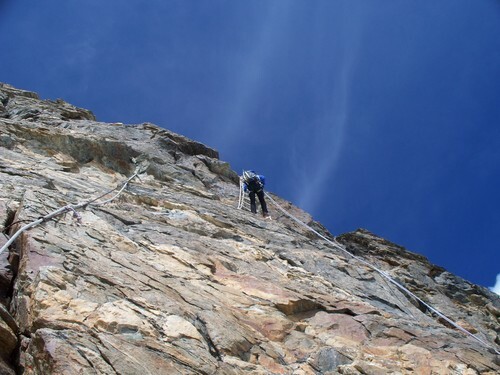 I climbed up alongside the Corde Tyndall chain for 30metres, whilst Steve belayed me. I found it easier to use the rock more than the chain itself. The good thing about it was that quickdraws fitted into the links so that you could place gear absolutely whenever you wanted to, simply pick a place on the chain and clip it. The chain finishes on some sloping slabs and I brought Steve up. By now, it was light and I was looking forward to getting some warmth from the sun. Boy, was I wrong! Just after leaving the chain, we popped out onto the ridge and were exposed to the winds coming over the north and northwest face of the mountain. The temperature plummeted and we went from cold rock to ice coated rock with patches of snow. I hurriedly got out of my coat and stuck on an extra layer. The process left me chilled to the bone and I asked Steve if I could lead off again to get the blood flowing back. I followed a line of snowy bootprints into a gap between two rocks until it became obvious I had to turn up the ridge using a thin crack to surmount the rock at my right shoulder. I began what would have been an easy short climb at the beach, but soon found myself a little precarious and nervous, trying to get some gear into the crack. To make matters worse, just 7 or 8 metres back, the pushy Frenchmen popped into the snowy gully, and instead of coming as far as me, bridged up over the sides of the gully, onto the easier slab above and clipped a huge eye bolt that I hadn’t seen! Half a metre higher and I found an old but solid looking peg. Obviously I wasn’t the first to think my line looked about right! I clipped the peg and to make the rope easier for us, I reached back to take the wire out of the crack. Stuck! Try as I might, it wasn’t budging so I left it there. Anyone who knows me as a climber will know that I often get stuck gear out and in fact the wire I had placed was one I had found stuck in a route some years previously! Easy come, easy go! By now the French were a ropes length ahead of us, and we were immediately behind the Spanish pair. To our right was the steep south face of the mountain, and to our left was the less steep but loose and icy ground over the north-west face of the mountain. We moved together up the ridge and every now and again, we pitched a little section. Not far below the shoulder we reached a knife edge section that had a thick ribbon of snow and ice on it. The snow had melted back so that only the footpath remained, standing about 15cm prouder than the rest of the ridge. There was a line of bucket steps up it and the surface was fairly soft. Because of the ground falling away both sides, there was no gear. Steve lead up it and chose not to stop to put his crampons on. Without any trouble, he got above that section and clipped a piece of tat that was buried into the ice at the foot of a small boulder. I followed along and we were soon just below the shoulder of Pic Tyndal. We knew we were well behind the guidebook time and had a quick chat about it. I had sensed that we were both a little nervous on the ridge and the cold had sapped our energy. By now though, we realised that the summit was within reach. We reasoned that we had food, water, the right kit and we weren’t lost! We had plenty left in us to get up and down, but would probably be descending the last part in the dark. We both agreed, if we got off the sw ridge and onto the fixed ropes, that wouldn’t be a problem as we would just use them to guide us back in. 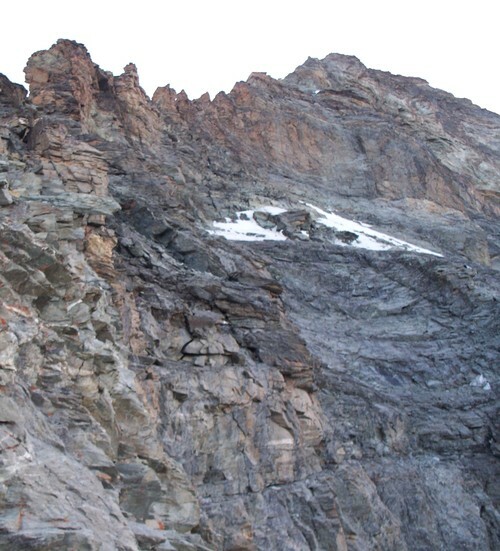 There are two climbers sitting on the top and two more descending the sw ridge. The steep skyline on the right caused us to move slowly later in the descent. We moved easily across the crest of the shoulder and dropped down into the col below the final tower. A few climbers were going past in the other direction having reached the top. We mixed some moving together and climbing in pitches up to the fixed ropes. We were now back on the sunny side and the rock was warm and pleasant to the touch. The ropes lead to the Jordan Ladder which although overhangs slightly in the middle, was easy to climb. 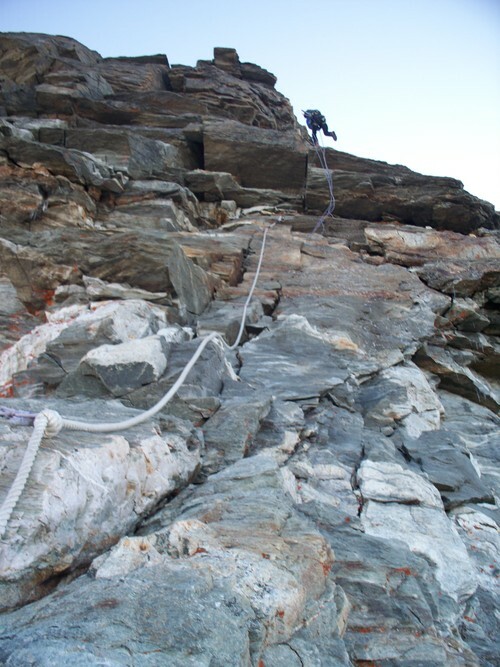 Another fixed rope on a traverse lead us to an easement and the easier last few metres to the Italian Summit. Steve was leading, but gallantly stopped short and offered me the last bit of leading to the summit. I was really touched by his gesture and readily agreed to go on ahead. I moved over the peak and dropped down slightly to the Summit Cross and waited for Steve. It was 1515hrs, and the views were fantastic! 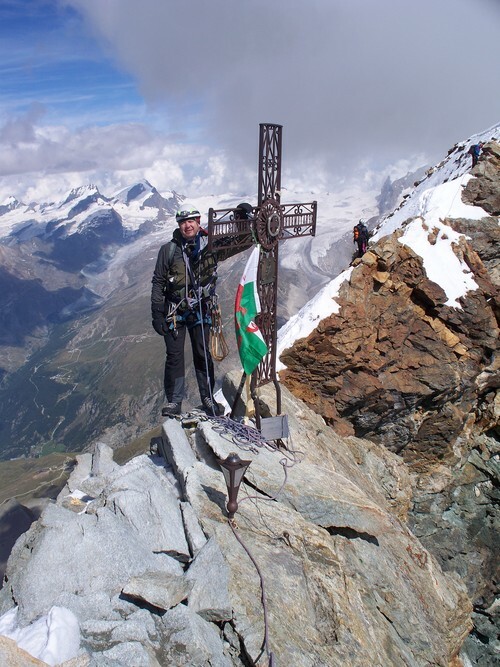 The pushy French were almost at the Swiss summit and the Spanish were just about to leave the Cross to follow them. Nigel Lewis at the Italian summit, Il cervino. Steve joined me and we sat in the sun for a while enjoying the view over our late lunch. We debated continuing on and down the Hornli ridge, but decided against it as we had no route description with us. The plan had always been to descend via The Italian ridge and that was what we should do. We figured it would add an extra hour or two to reach the Swiss summit and get back here, so decided we had done what we set out to do and it was now time to race the sunset and get back. From the Italian Summit, the first abseil took me direct to the foot of the Jordan Ladder. The 50 metre rope just reached the next abseil point and I clipped in allowing Steve to follow me. We pulled the ropes down and I went to take the belay device off my harness, where I had clipped it minutes before. Not there! With my gloves on, I must have mis-clipped it and it had tumbled off unheard down the abyss below me. I hadn’t even used it on the way up, protecting Steve using Italian hitches instead. The sole reason I had brought it was to use it on the many abseils as I knew it would cause the ropes to twist far less than the hitch would. A mixture of down climbing and abseiling brought us to the enjambee below the shoulder. We had settled on a format of me leading every abseil and Steve following behind to untwist the ropes as he came down, hopefully preventing any rope jams. From watching the mountain during the week, we knew that thick cloud built up over the south face every afternoon. 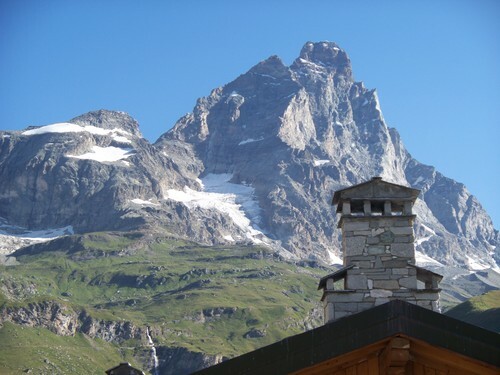 (We reckoned that the Swiss had put ‘fog pipes’ into the mountain and manufactured the clouds so that the Italian view was less visible than the Swiss view of the mountain!). In reality, it was caused by the cold air coming over the frozen north side of the shoulder, mixing with the warmer air that rose over the south face. 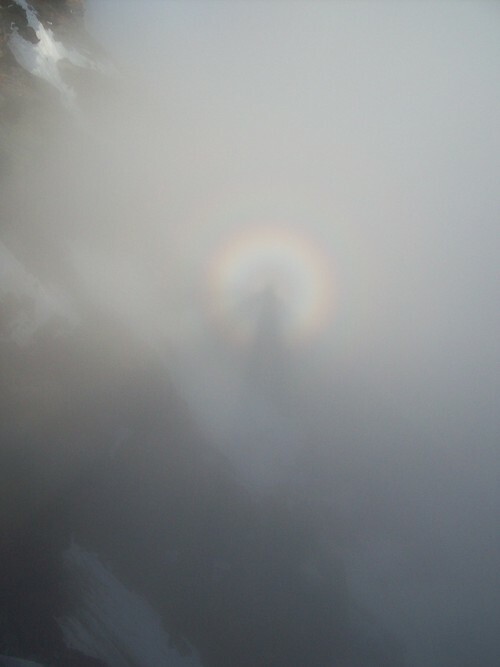 The sun was getting lower on our right shoulder and as we crossed Pic Tyndall, our shadows were thrown onto the clouds and surrounded by halos to make ‘Brocken Spectres.’ They looked great and the photos don’t do them justice. Sometimes they had one halo, sometimes two and once even three! As we began descending the sw ridge, it got dark. The only difficulties we saw were being able to find the abseil rings in the dark and making sure we dropped off the ridge and onto the south face at the right point. Nearing the start of the sw ridge descent. Switzerland is sunny but icy, Italy is cold but dry! Things slowed right down because of the conditions. We simply took our time and kept plodding down, either abseiling or down climbing. When we reached the icy section with the ribbon of snow, it had frozen hard. If we had put our crampons on a little earlier, it would have made this section much easier. However, in the dark we had come lower than we thought, and by the time we should have put them on, we were already in the danger zone. We were attached to each other, but at this point, not the mountain. Getting it wrong here would be really getting it wrong! I found the frozen tat we had clipped on the way up and backed that up with an ice axe placement. Steve slowly down climbed facing in, using the frozen steps and his axe. When he reached safer ground, he was able to find a precarious sling placement and clipped into it. I abandoned a krab on the tat and down climbed with the rope running through that, but not actually really wanting to place any of my weight on it! Lots more abseils followed, sometimes it was easy to find the next ab station, sometimes it took 10 to 15 minutes. Although there were no big snow patches, the rock was occasionally verglassed and needed care. At one point, we simply couldn’t find the ring bolts and set up a natural abseil on the rock. We dropped half way down the rope and found the right line again with a big bundle of tat to clip into. Of course, nothing is easy and as we tried to pull the rope down, it was jammed fast. We moved around a bit until we got to a spot where if we both pulled on the rope it slowly came through. We eventually reached the spot where we thought we should come off the ridge and find the Corde Tyndall Chain. We knew it was slightly below the crest but just couldn’t find it. A few times whilst descending, we thought we had arrived at this point, but now we were here, we were convinced we were in the right place and annoyed with our inability to find 30 metres of thick chain! I abseiled off to the south side and after dropping to a ledge some 20 metres below, realised it was not the right way. The ledge was covered in shattered rock and smelled strongly of cordite as if it hadn’t long fallen there. I glumly climbed back up and we cast around again. Suddenly, there it was! About two metres further than when I had last looked in that direction. From glum to glad in a few seconds. All we had to do now was follow the chain down, cross the bowl to it’s bottom right corner, and follow the fixed gear back to the hut. Home and dry! Or so you would have thought! The chain is 30 metres long, but if you run the rope through a mallion just below the top, the rope stretch is enough to reach less steep ground. As was our fashion, I went first, followed by Steve. At the bottom we pulled the rope, but it simply would not budge. We moved as far across the ledge as we could to try a different angle, we tried flicking the ropes, we tried pulling together, we tried pulling the other end. Whatever! It wasn’t going to come down. 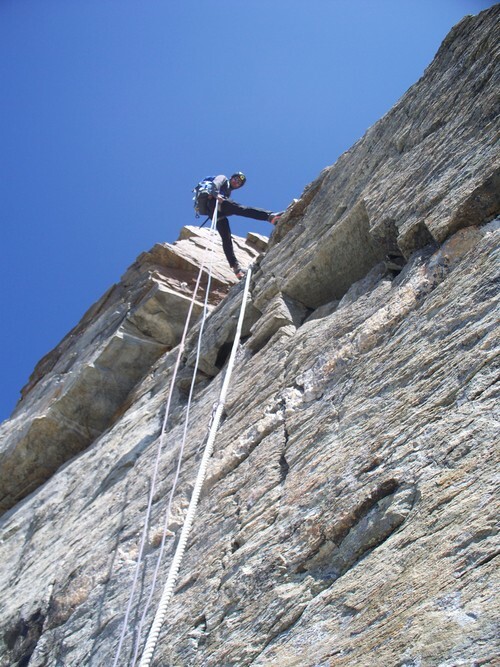 Because the full rope length was out, we would have to free climb up the chain, prussik the rope or protect it somehow. Neither of us was that keen to do it and I picked up a little bit of tat from the floor, bunched it into my fist and put my hands behind my back. “If you pick it, you decide who goes.” I said to Steve. He looked at me and promptly snaked his hand out, tapping the fist with the marker in it. Me to go then! I dropped off my sack, borrowed Steve’s belay device and set off back up the chain. I had set a prussik on one strand and got Steve to tie into the other so it couldn’t suddenly release. I also had a sling to my harness and a quick draw so I could clip the chain. Actually, as I got going, I found the climbing easy enough and soon got to the top. The problem was that the mallion trapped the rope between itself and the rock face, so that when you pulled on it, it acted like an Alpine Clutch. I moved the rope to another ring bolt and it moved freely. A quick abseil back down again and we were off again. Remember the ascent, when we were all like scurrying ants? Well we were now in the same place, but it was about 0230 in the morning. Try as we might, we were having real difficulty finding the way out of the shallow bowl we were in. We knew roughly whereabouts we should go, but were worried about descending too far and then not being able to get back up to where we should be. Steve was convinced the route was higher and we had already come down too far, whilst I was convinced it was lower and we had not descended far enough. What a spot for moon bathing! We eventually found a pile of tat to tie into. We were cold and tired, but still well in control of the situation. We pored over the route description, trying to reverse it in our minds. We had a couple of choices; abseil down a ropes length and see if things seemed different from that view, wait until it got lighter or wait until we saw the next days climbers ascending and spot the route from their movements. We knew that we could see head torches at any moment, particularly as on the previous day we had been woken at midnight in the hut by people preparing to leave. It was really frustrating being so close to the route, so close to the hut, able to continue but being unsure as to the way to go. We sat there for a while debating the issues and decided to wait it out for a bit. The views were still impressive as we could see the lights of Cervinia a few hours below us. There wasn’t a cloud in the sky and the stars looked so close. Twice we saw shooting stars. After about 40 minutes we were getting colder by the minute and really fed up, so we decided to abseil and see if we could make some progress lower down. As we were getting ourselves back into order, we saw the torches coming up toward us. They were off to our right and below us. But would they traverse below us or climb up to our right and pop out above us? We watched them for another 45 minutes or so, and made our minds up. The route was below us. We rigged the rope to abseil off our tat and lo and behold, abseiled 25 metres directly onto the end of the fixed wire! Of course we were glad to be back on track, but again, so frustrated as to have been so close all the time. Had we chosen the descend option earlier, we would have saved ourselves around 2 hours of moonbathing! We waited for a few people to exit the fixed wire and then set off along it. People coming towards us were obviously more important than us as they made it plain we should be waiting off to one side for them to take precedence. I’m not sure I agreed, and either way, we kept going. As we were on the Mauvais pas, it started to get really quite light and as we descended toward the fixed ropes, a few people asked whether we had given up and were returning or were just super fast and already on the way down. It raised a few wry smiles when I explained we had not turned back, but neither could we claim a particularly speedy trip! 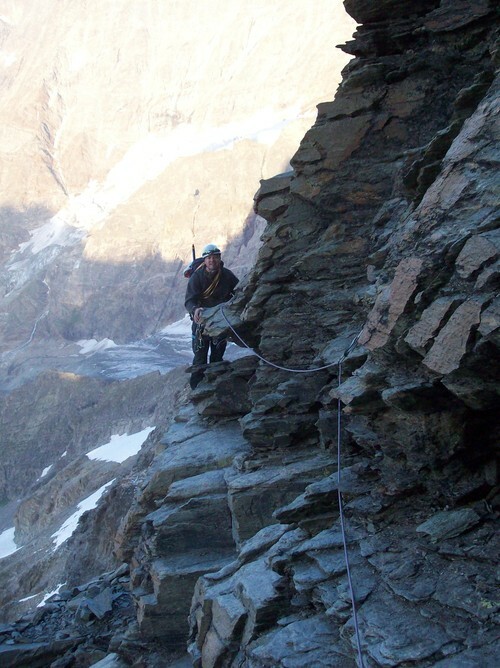 Steve K abseiling alongside some of the fixed gear leading from the Carel Hut. At 0800hrs, Saturday 15th August, 27 hours after starting, we had our picture taken on the Carel Hut balcony. The hut was almost empty and we had a quick four hours of poor sleep. I have to admit, my feet were bloody freezing and I couldn’t get them warm again! Just after midday, we began our descent, but this time straight in to Cervinia not to the cable car. At 1600hrs we dumped our sacks in the hire car and went straight off for a well earned and somewhat smelly beer! Was it hard? Yes, undoubtedly. That’s the longest I’ve ever pushed through without sleep. The Carel Hut can be seen as a little silver speck about level with the summit of Testa Leone on the left of the picture. Do I wish we had turned around earlier? Absolutely not! It was frustrating being so close to the route, simply unable to find it in the dark, but I wouldn’t have swapped that summit for a few more hours in bed, no way! This was the culmination of a great week with a great mate, I would definitely do it again, except that there are so many other mountains to climb! Nearly all of our route can be seen in this picture. By Mountain Experience in Uncategorized on 17/04/2017 .